Our December meeting was a social occasion. 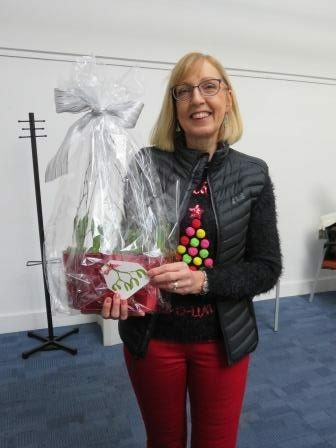 The competition was to paint a parcel label, the winner was Carol Hardy with a lovely painting of mistletoe. We held a bring and buy, inviting members to bring unwanted books and art materials. This was followed by a buffet lunch provided by Tommy’s Catering. Best wishes to everyone for a ‘Happy Christmas’ and successful painting in the New Year. Our meetings for 2019 begin on 20th January with something different a talk about snowdrops which we will follow by painting snowdrops. This month Billy Showell gave a workshop on painting Fuchsias. The workshop was enjoyed by those attending and lovely work was produced. Our meetings take place at Stirchley Baths, these Victorian Baths were converted into a community centre a few years ago. For us the rooms are ideal they have glass ceiling windows giving plenty of light, this is also the reason there are tiles in the background of many photographs. In December we have our ‘Paint a Postcard Competition’ this will be followed by a buffet lunch (provided by caterers) and a new venture a Bring and Buy Sale. Members can bring their unwanted art materials, books and DVDs which will be for sale all proceeds going to the seller. 2019 will be the 20th Anniversary of the formation of this society. Our programme for the year is being developed and will include a special event in September to celebrate this anniversary. 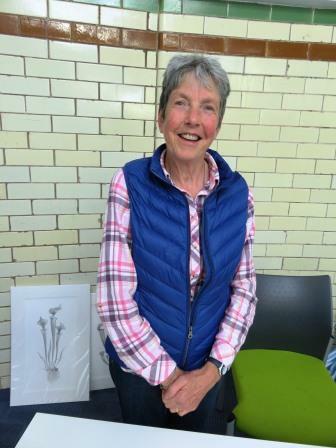 On 21st October the society welcomed Julie Small for a workshop giving hints and tips on graphite pencil work. 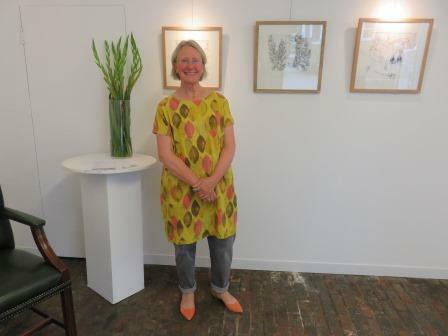 Julie is an experienced tutor and has been awarded a Gold Medal by the RHS for a series of graphite pencil drawings. 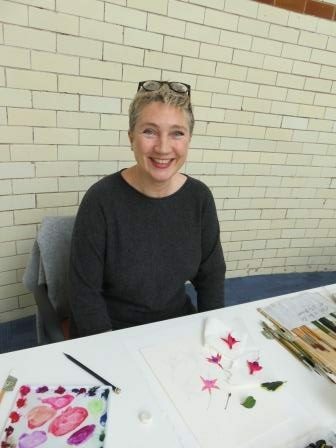 Julie’s work has also been used to illustrate books on botanical art. Julie brought along some of her work for us to see. The society will once again have a stand at Art Materials Live at the NEC which is open from 1st – 4th November. On display will be work in watercolour, coloured pencil and graphite. Members of the society will be demonstrating each day. Mark Frith: a legacy of ancient oaks. Portraits that highlight the architectural beauty of tree trunks, bark and branches in winter. Botanical Theatre: the art of Pandora Sellars (1936 – 2017) Colourful and detailed plant portraits. Society member Jane Edwards has an exhibition at Winterbourne House and Garden, Edbaston Park Road, Birmingham B15 2RT. The exhibition ‘Recent Drawings’ is on until 16th October. The gardens at Winterbourne are looking stunning so well worth a visit. Our next meeting on 16th September is a ‘Painting Day’ all are welcome. Guy William Eves tutored a workshop on 18th August. 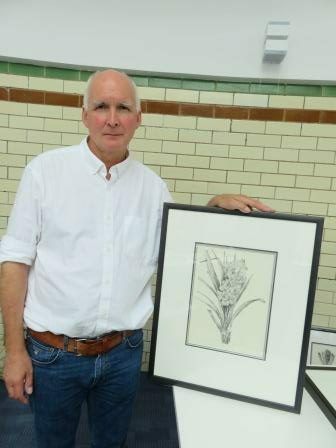 Guy began by giving some background into his life before botanical drawing took over. He explained that he draws living specimens, intricately setting up the stem and flowers into what will be the final composition. He very very rarely uses photographs. Guy then demonstrated his technique using a variety of graphite pencils some with sharp points others cut at angles and using small lines. This showed his patience and eye for detail. It was then our turn to try the technique. Members of our society have paintings in exhibitions during August and September.